Now, when someone gives you lemons, wouldn't it be rude not to bake him (or her) a cake? As a thank you, I baked these Meyer Lemon Almond Cakes with Candied Meyer Lemon Slices. I have to admit, I was pleasantly surprised by how well these cakes turned out! The lemon flavor is present without being too overpowering. The almond flour adds nuttiness and beautiful brown flecks to the batter. The texture of the cake is surprisingly light and fluffy. 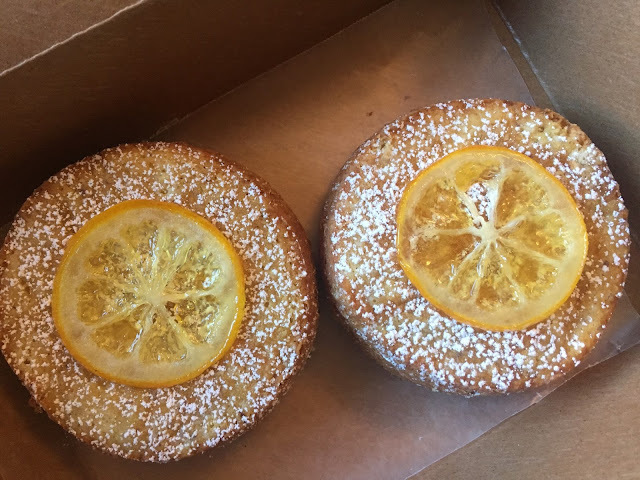 Now, you know me, I can't give anyone a naked cake, so I decided to top them with a light dusting of powdered sugar and a candied Meyer lemon slice. So pretty, don't you think? 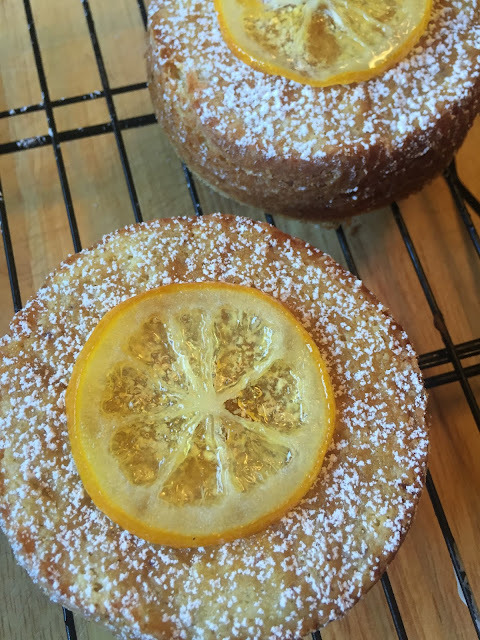 If you're more of a glaze person, which I tend to be on most days, you can also drizzle the cakes with a fresh Meyer lemon glaze. I've included the ingredients and recipes for both options below. No matter how you top them, I hope you enjoy a delicious slice of sunshine! Butter and flour 5 mini 5" springform pans (or 1 8-9" springform pan). Whisk together the dry ingredients in a medium size bowl and set aside. Place the sugar and lemon zest in the bowl of your stand mixer (or a large mixing bowl if using a hand mixer) and squeeze/crush the zest into the sugar using your finger tips. The sugar will become infused with the oils from the zest making it really fragrant. Add the butter to the sugar/lemon zest mixture and cream at medium speed until light and fluffy, approx. 2 minutes. Scrape down the bottom and sides of the bowl with a rubber spatula. Add eggs, one at a time, mixing just until combined and scraping down the bowl with a rubber spatula after each addition. Mix in vanilla extract on low speed just until combined. With mixer on low speed, gradually mix in the flour mixture just until combined. Do not overmix. Using a rubber spatula, fold in the sour cream just until incorporated. Do not overmix. Divide the batter evenly between the prepared springform pan(s). Place the pan(s) on a baking sheet and bake until the cake springs back when lightly touched and/or a toothpick inserted in the center comes out clean (approx. 35-45 minutes for an 8-9" springform pan or approx. 20-25 minutes for mini pans). Note: to prevent overbaking, check for doneness at the beginning of the bake time and continue baking as needed just until done). Remove and place on a wire cooling rack to cool. Remove from the springform pans. 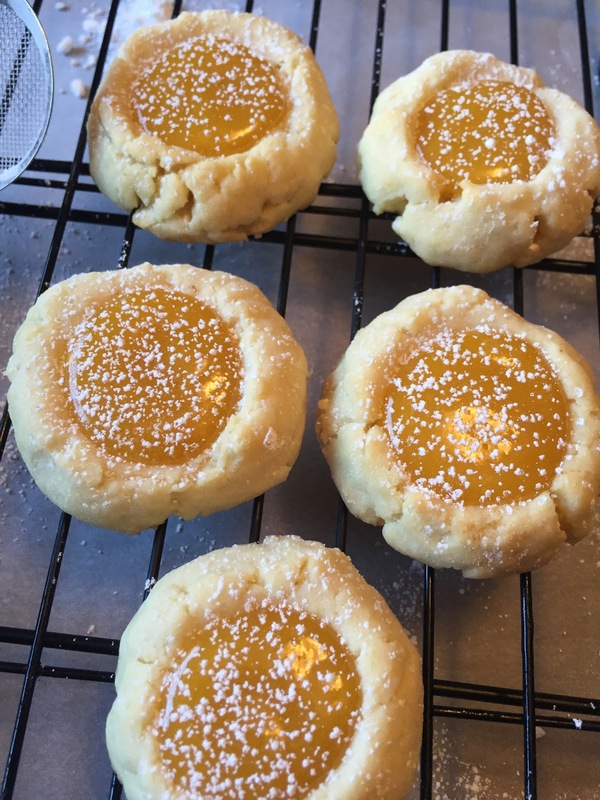 Sprinkle with powdered sugar and decorate with candied meyer lemon slices (if desired). 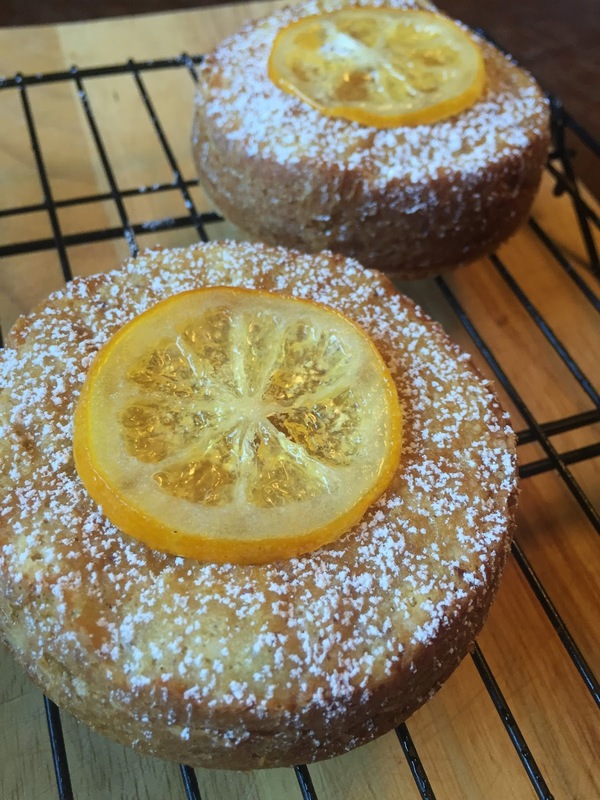 You can also drizzle lightly with a meyer lemon glaze. Both recipes are below. 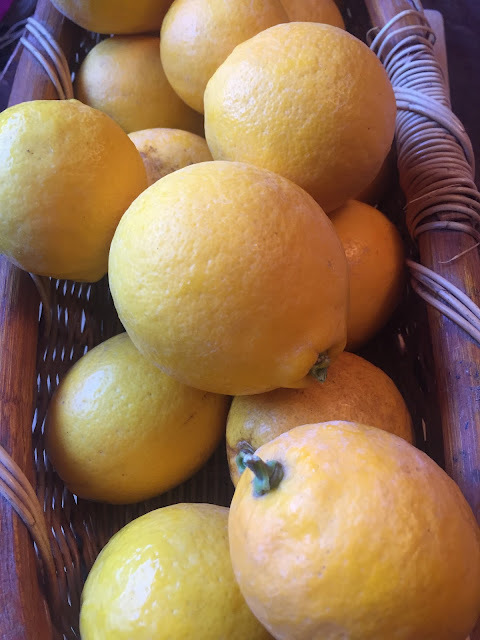 To make the candied meyer lemon slices - bring sugar and water to a boil in a wide, shallow pan (like a skillet) stirring to dissolve the sugar. Add the lemon slices making sure they're in a single layer and reduce heat to a simmer. Allow to simmer until the rind becomes translucent (approx. 20-30 minutes). Remove from heat and allow the lemon slices to cool in the sugar/water mixture. Remove from the pan and place on a wire cooling rack placed over parchment paper (to catch the drippings). Allow to stand at room temperature for a few hours. To make the fresh meyer lemon glaze - place 1 cup of powdered sugar in a medium size bowl. Add 1 tablespoon of softened butter, the lemon zest and 1 tablespoon of fresh meyer lemon juice. Mix well with a spoon. Gradually add additional lemon juice, a little at a time, stirring well after each addition until you reach desired consistency. The glaze should be thick but pourable. 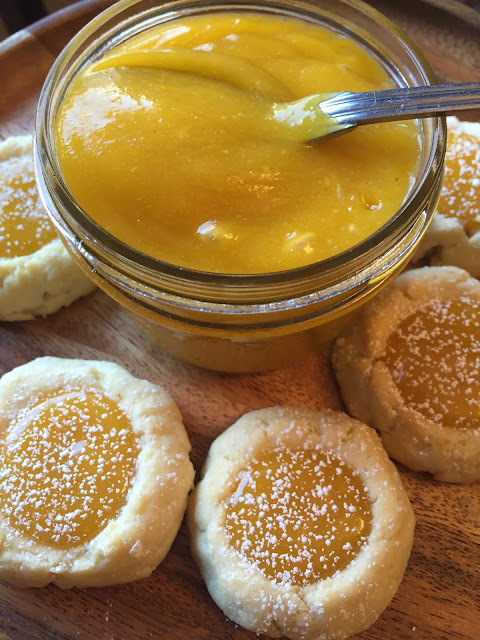 I am in love with sandy beaches, tropical drinks, warm island breezes and this Passion Fruit Curd! How about you? 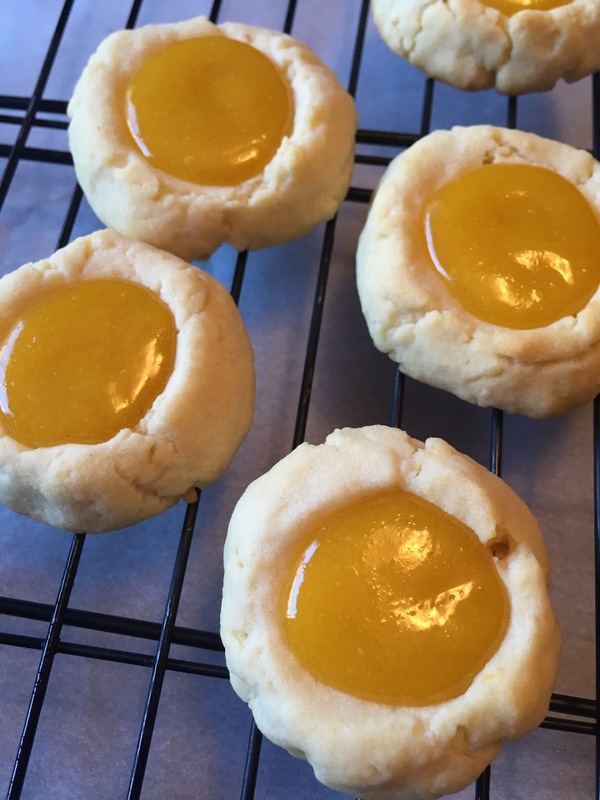 I originally shared the recipe as a filling for a Vanilla Cake, but for this month's Creative Cookie Exchange, the theme was "Tropical Cookie Take Me Away" and this amazing Passion Fruit Curd immediately came to mind. 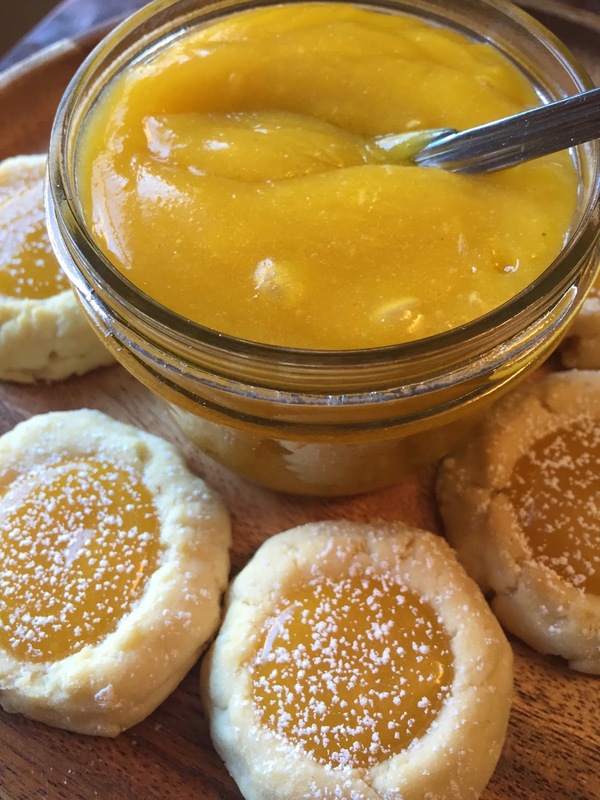 Passion Fruit Curd paired with shortbread cookies is sweet, tropical perfection. ** The curd recipe makes approx. 2 cups of curd. You will have leftover curd which should be stored in the fridge. 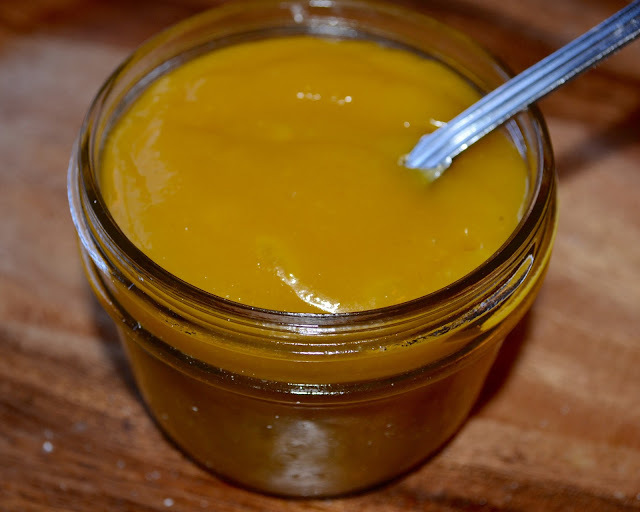 Combine the egg yolks, sugar and passion fruit puree in a saucepan. 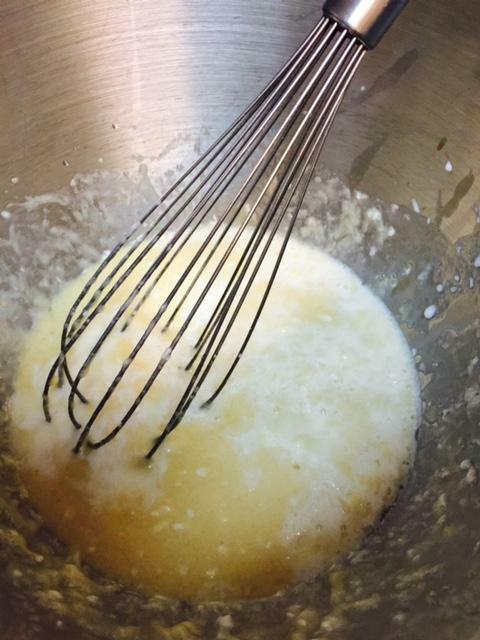 Cook over med-low heat whisking constantly until thickened enough to coat the back of a spoon (this takes approx. 5-10 minutes). Remove from heat add a pinch of salt and gradually whisk in the butter until completely melted. Strain through a fine mesh strainer into a glass bowl or jar. Cool completely then refrigerate. Whisk the flour and salt together in a small bowl and set aside. Place the butter and sugar in the bowl of your electric stand mixer fitted with the paddle attachment and mix on medium speed until light and fluffy (approx. 3 minutes) scraping down the bowl with a rubber spatula as needed. 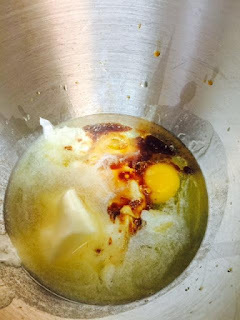 Add the egg yolk, lemon zest and lemon juice and mix just until combined. Add the flour and salt mixture and mix on low speed just until big clumps start to form. Using your hand, form the mixture into a ball. Shape into 1" balls and place onto prepared cookie sheets. Using your thumb, create a well in the center of each cookie large enough to hold about a tablespoon of curd. Bake approx. 15-18 minutes or until just lightly browned on the bottom. Remove from oven and fill each well with curd. Return to the oven for 1-2 minutes to allow the curd to set. Remove from oven and place cookies on a wire cooling rack to cool completely. Sprinkle with powdered sugar. To make ahead, bake the cookies but do not fill with curd. Fill each cookie with curd and sprinkle with powdered sugar just before serving. I may be tardy to the party, but have you discovered smoked, flaked sea salt? Have you ever sprinkled it on chocolate chip cookies? The flavor combination is amazing! The smokiness of the sea salt adds a depth of flavor you don't get with just regular flaked sea salt. Now add dark chocolate and espresso to the equation and you have a cookie that means serious business. My partner for this month's Leftover's Club is Kathia from Basic and Delicious. Kathia and I have been partners before and she actually lives in the same city (well county) that I do...San Diego! I was really excited that my partner lives so close, because let's face it, stale cookies are no fun. I knew these cookies would arrive to her while still fresh and I am a stickler for freshness when it comes to baked goods. Honestly, I could have just hand delivered them straight from my oven to her door. Why didn't I think of that sooner? I think Kathia will really enjoy these cookies. They're bold, sophisticated and fun! If you'd like to join in on the fun and swap baked goods each month with a fellow food blogger, please sign up at Alwayz Bakin. We'd love to have you in the group! Place the coconut oil and unsweetened chocolate chunks in a bowl placed over a pan of barely boiling water. Heat until melted stirring often. When completely melted, remove the bowl from the heat and allow the chocolate mixture to cool to room temperature. Place the eggs, sugar, vanilla extract and espresso powder in the bowl of your stand mixer fitted with the paddle attachment (or use a large bowl and your electric hand mixer). Mix on med-high speed until light and fluffy (approx. 5 minutes). The mixture should stream from the paddle in thick ribbons. Using a rubber spatula fold in the cooled chocolate mixture, then fold in the flour mixture, then fold in the dark chocolate chunks. After 1 hour, preheat your oven to 350f and line a few baking sheets with parchment paper. 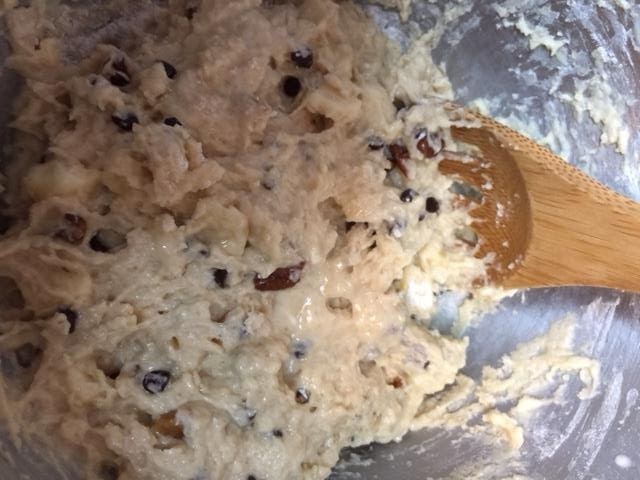 Using a small cookie scoop, place scoops of dough onto the prepare cookie sheets approx. 2" apart. Sprinkle the cookies with the smoked, flaked sea salt. Bake one sheet at a time (unless you have double oven) for approx. 10 minutes, rotating the cookie sheet front to back halfway through the baking time. Sprinkle a little more sea salt on each cookie halfway through the baking time if needed. Remove from oven and allow the cookies to cool directly on the cookie sheet for 2 minutes. Remove from the cookie sheet and place on a wire cooling rack. Ok, I know it's the time of year when we should be dieting, and part of me is per se, but one thing I have probably mentioned before is I have a very, very hard time giving up bread! Any type, any kind, I LOVE them! So, in keeping with the healthier eating goal, I had to find a way to stop going to Starbucks for coffee and piece of loaf bread or muffin every other day :-). 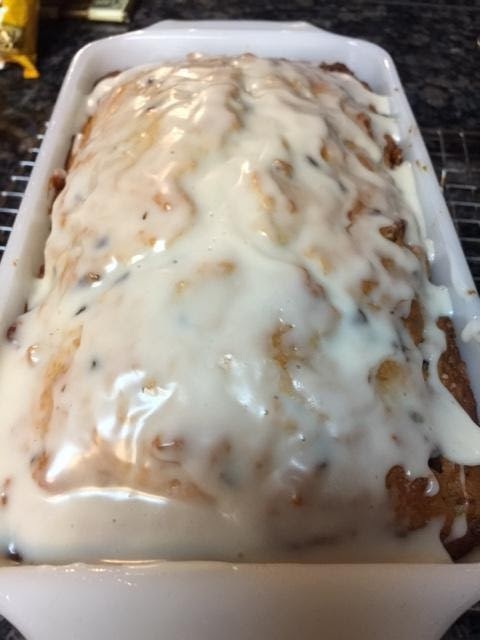 I have been working on this easy and delicious loaf bread recipe for a few weeks now (trust me, I have baked plenty of loaves these last couple of weeks!) and I have finally perfected it! 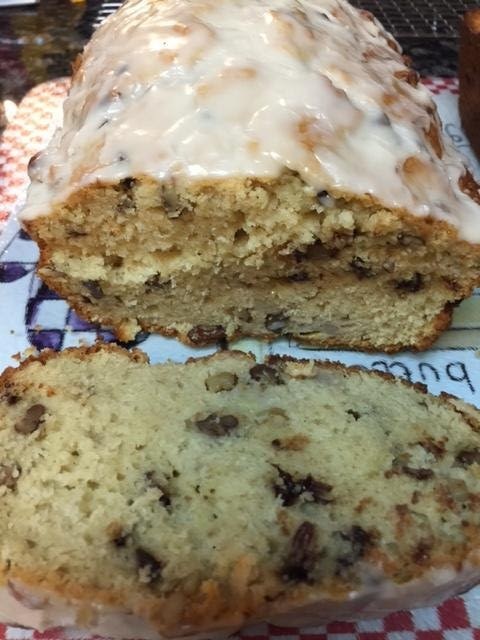 Now that I have my perfect recipe, I can bake it on Sunday and have my breakfast bread for the week which I enjoy with yogurt or maybe a boiled egg and coffee I brew myself at home. Oh, I still miss my morning Starbuck runs, but now they have at least decreased and I actually enjoy it as a special treat. 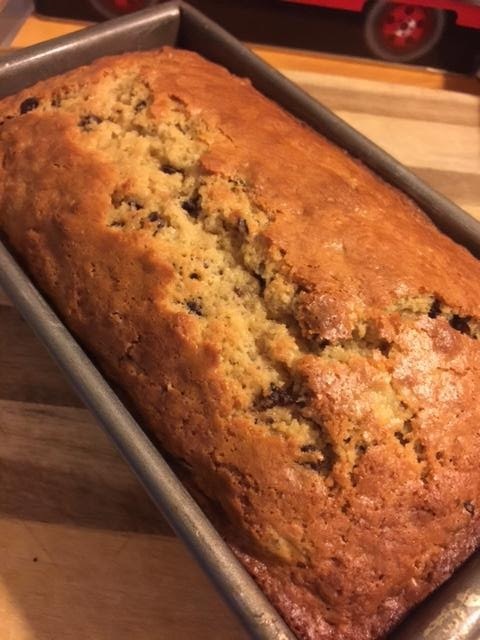 Plus I'm satisfying my craving for bread with a recipe that is probably better for me while saving some money in the process! So now about the bread.... it's s hearty, flavorful, and perfect for coffee. 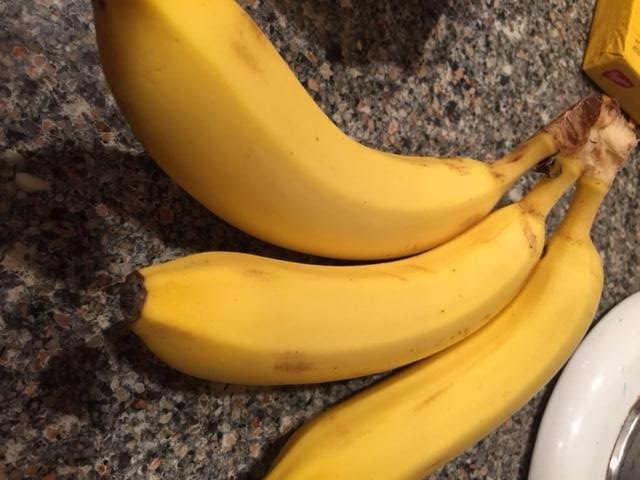 I have made it most often with banana, not the brown mushy kind more suited for banana bread, but with a perfect yellow banana at just the perfect ripeness for eating (picture below). 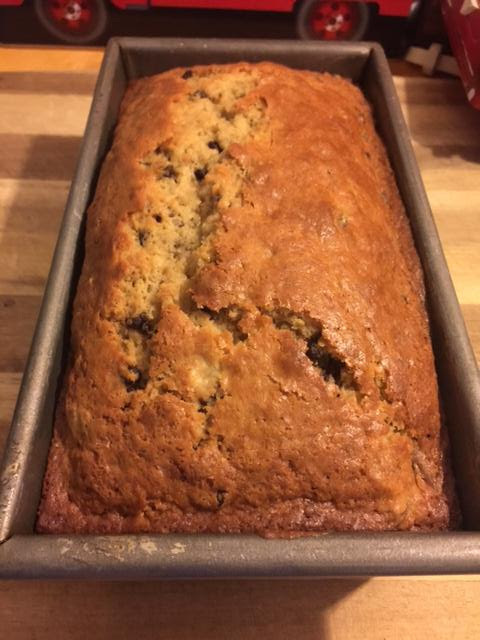 I have occasionally switched out the banana for blueberries and the bread is just as good. Trust me, the base recipe is what counts! Switch out the fruit and use your favorite. I hope you enjoy the recipe. Happy Cooking Everyone! 3/4 Sugar (I have used 1/2 cup if you want to make it less sweet. 1. In large bowl, whisk the flours, sugar, baking powder, baking soda and salt until well combined. 2. Add the chopped banana (or blueberries), nuts and chocolate chips. Stir with a spoon until everything is coated in flour. 3. 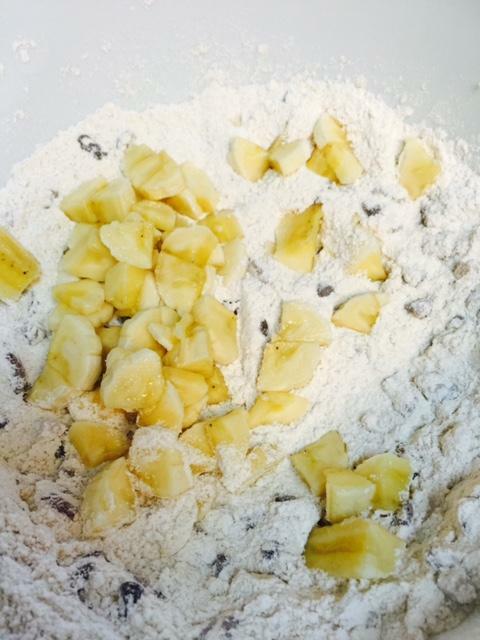 Create a well in the middle of flour/banana mixture and set aside. 4. In a second bowl, whisk together the 2 eggs, yogurt, oil, melted butter ,vanilla and milk. 5. Once combined, pour into the well you created in the flour mixture. 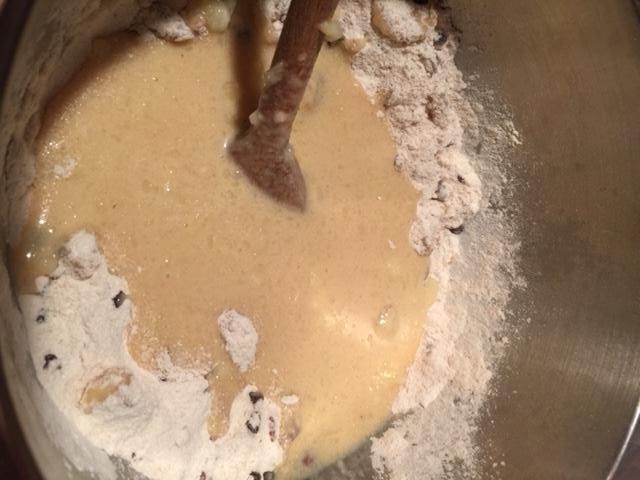 Stir with a spoon just until all of the flour has been blended into egg mixture. DO NOT OVER MIX. 6. 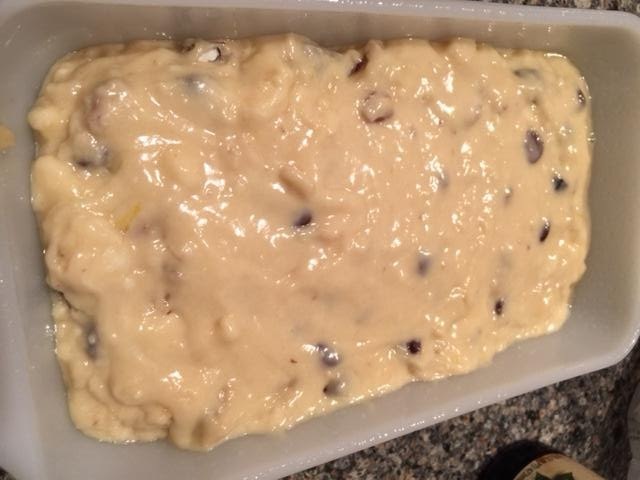 Pour into the prepared loaf pan. If you would like to add a simple glaze... just combine 1/4 cup powder sugar and 1 tablespoon milk and 1/4 teaspoon of vanilla extract. Pour over slightly warm bread.